MANILA, Philippines -- With the rainy season has officially here, an environmental watchdog is warning parents to be careful about choosing raincoats for their children. EcoWaste regularly scours markets and stores, usually for cheap and popular children's products, and has these tested for toxic content. 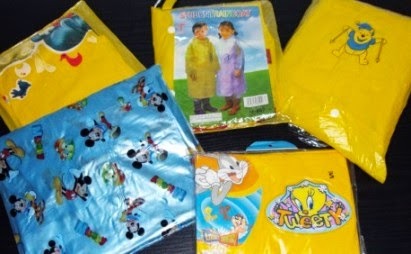 “While it’s true these raincoats can prevent kids from getting wet, the lead and other hazardous substances on the PVC plastic material or design may make them sick in the long term and pollute the environment as well,” warned Thony Dizon, coordinator of the EcoWaste Coalition’s Project Protect, in a statement released by the group. Lead, in particular, can damage or retard brain development and cause health problems, learning disabilities, lower IQ scores, shorter attention span, poor impulse control and aggressive behavior. Phase out lead and other toxic chemicals in the production process and shift to safer ingredients. Disclose chemical content information of their product as a condition for sale. Respect the consumers’ “right to know” about chemicals in products, including the provision of complete and truthful labeling to promote consumer choice.